Cyber-Vipers' grey weapons tree included two rifles, a machine gun, a flame thrower, a knife, two missiles and a figure stand. All six Mega Marines also came with moldable Bio-Armor, an armor mold and a missile launcher. 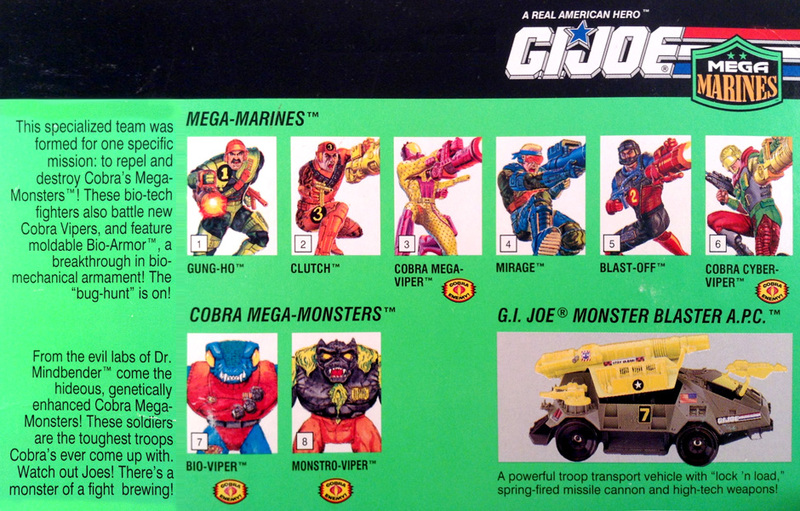 The Mega-Marines featured four Joes and two cobras, while the Mega-Monsters featured two oversized genetically enhanced soldiers. There were two unique logos for both the Mega-Marines and the Mega-Monsters featured on the front and back of the packaging.